With three fiery explosions and a shuddering crash, a historic Saskatoon bridge came crashing down on Sunday morning. The planned demolition drew an audience of locals, eager to watch the spectacle and bid goodbye to one of Saskatoon's earliest landmarks. CTV Saskatoon's News Director Dani Mario was on sight Sunday to capture the demolition. Here is a video of the bridge coming down. The Saskatoon Traffic Bridge was first opened in 1907. At the time, it cost about $105,000 to construct and took less than a year to build. The bridge played a key role in the city's history. Before its construction, Saskatoon was broken into three separate settlements. But the promise of a traffic bridge helped convince the Nutana settlement, in the east, to amalgamate with its neighbours, and help form the City of Saskatoon. A century later, in 2005, the city deemed the bridge unsafe because of the way the steel structure had corroded. On Sunday, the historic crossing came down for good. 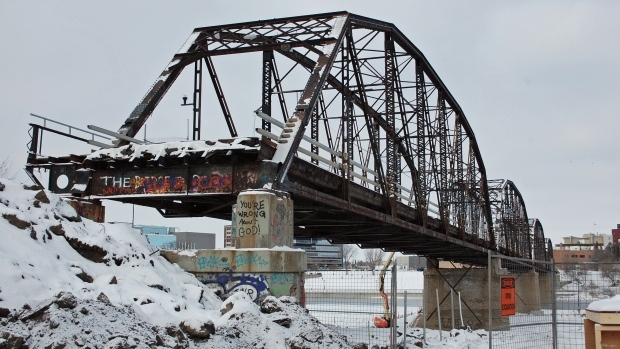 Now, Saskatoon plans to build a new Traffic Bridge in the old bridge's place. The city has secured both federal and provincial funding to build the new bridge, and plans to construct the new crossing in a similar historic style. Unlike its predecessor, however, the new bridge will be slightly wider and taller to accommodate for bigger vehicles and more traffic. It is scheduled to be completed and open to vehicles, cyclists, and pedestrians in 2018.